This stylish German turnable is the first we have encountered from the elusive Dr Feickert, seen and heard at Munich's High End show in May. The Woodpecker is the least expensive turntable that he makes, yet it embodies the principles that you find in the top Twin and Triple designs whilst managing to look entirely contemporary. It's distinguished by a large cut-out which means you can slide the armboard along and accommodate tonearms between nine and twelve inches in length. 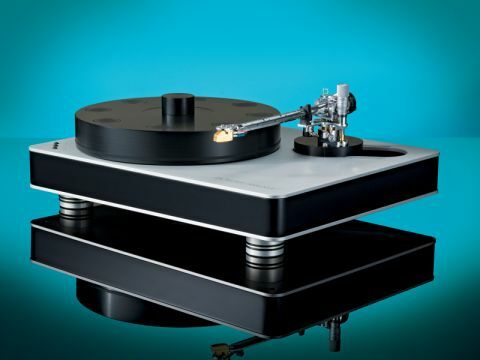 This makes it one of the most flexible, yet elegant turntables we've seen in a long time. Dr Feickert's bag is analogue, the name says it and so does the fact that it has produced something called Adjust+, the first and only computer software that we've seen for setting up cartridge azimuth. Dr Feickert also makes a very precise alignment protractor called Pro Tractor NG and three other turntable models, including one that can accommodate three tonearms. Excessive, perhaps, but it looks damn cool. The Woodpecker is the entry level model and incorporates motor, bearing and armboard in a solid and fairly substantial slab of plinth, with aluminium facing top and bottom. Interior construction uses constrained layer damping, a technique of combining different materials to combat resonance. It may not look it, but the turntable's plinth is made from laminates that consist of aluminium and tempered MDF; that is MDF that has been heat-treated prior to lamination. The whole sandwich is then machined and given a Delrin (acetal plastic) surround. Atop the laminations mentioned there is an anti-resonance 'circuit' made of an unspecified, but apparently significant type of steel. This also supports the platter's bearing. The latter is a stainless steel inverted type that you lubricate with a grey grease that Feickert refers to as 'fat' and is considerably thicker than the oil used in most turntables. The platter and armbase are also made of Delrin. This is a softer material than acrylic and is, therefore, closer in character to vinyl than acrylic (we've seen it before on the Townshend Rock 7) and it seems to work extremely well as a platter material. The example on the Woodpecker is loaded with cylindrical brass weights to increase mass (to 6.2kg) and thus inertia. This Inertia platter is usually a £595 optional extra, but UK distributor Angelsound is offering it for the standard price until the end of July 2010 (the turntable normally has a solid acetal platter). In both cases, a screw-on acetal clamp is supplied, which dishes rather than flattens the vinyl in order to improve resonance absorption. The motor is a three-phase DC design that acts like a phase locked-loop (PLL) and has all its supply electronics internally which keeps things tidy from a manufacturing perspective. Placing the power inlet underneath the plinth keeps things aesthetically tidy, too, while power is derived from a wall-wart supply that has a power indicator. There are apparently two power supply upgrade options in the pipeline, due to be finalised this year. Turning the motor on and off is done with the buttons marked 33 and 45, each acting as a start/stop switch. The hole above each button allows fine speed adjustment, but ours ran true out of the box. A third button marked S is for an as yet undisclosed function, although there is an S version of the Woodpecker which offers 78rpm and, in that instance, the central button controls speed, but in the standard issue it's purpose has yet to be declared. The Woodpecker's build quality is extremely high; the quality of fit and finish lives up to the standards of German engineering and is entirely commensurate with the asking price. The screen-printed figures on the armboard cut-out are very well executed, but you really need the Feickert Pro Tractor to position an arm precisely and we found the armboard readings to be slightly at odds with the protractor. The Delrin armboard itself has a protrusion underneath that slots into the cut-out and stops any unwanted twisting when setting up. You bolt the board down to captive threaded inserts which slide in the two grooves. It's a well thought-out design and one which makes set up remarkably easy, given the range of arm sizes it will accommodate. There is plenty of competition at this price of course, albeit none which offers the scope to fit with different length arms without a deck upgrade. The key players are: the SME Model 10; Kuzma Stabi-S (which has a 12-inch option); and the Well Tempered Amadeus, with its golf-ball-in-silicone arm bearing. All offer a similar level of build quality to the Woodpecker, although the SME is the only one that we feel is clearly better, while the last option has its own tonearm. Angelsound's answer has been to offer the Woodpecker with the standard (non-micrometer) version of the Audiomods Series III arm for £3,195 which is an exceptional deal. As we had the Audiomods arm to hand, this was a logical starting point for the review, the two aren't designed for one another, but they seem to work well. Using the Feickert protractor, you can precisely set arm position, overhang and alignment. The reward is a calm, precise presentation that has remarkable pace and bandwidth. It's the bass that hits home to begin with: it's in the same class as a Rock 7 despite the absence of a damping trough – which is a neat trick. Bass lines are delivered in remarkably coherent fashion and can always be picked out even in the densest mixes. In fact, everything can be picked out; there is a clarity to the sound, a lack of exaggeration that reveals oodles of detail, but doesn't get in the way of the music. All too often turntables that are revealing and clean can also sound clinical and heartless, but this one allows the quality of the format to shine through. Switching over to an SME V tonearm leads to a more muscular sound, one that is bolder and a little more vibrant, not necessarily better in all respects but it does make for some awesome syncopation with a nice slab of ZZ Top. Playing more vinyl shows more facets of the turntable's potential, each disc giving up the characteristics of its recording. As a result the better stuff really shines, ECM live recordings, for instance, have a depth and presence that's extraordinary, whereas slick studio productions like Rickie Lee Jones' Flying Cowboys positively ooze luxury. The ability to expose differences in recording character reveals just how analytical and uncoloured this turntable is. There's very little to get in the way of the signal because it keeps its own resonances so tightly controlled. And yet this doesn't make it sound dead; rather the music takes centre stage so you can enjoy its subtlety, power and charm. As you can tell, we enjoyed this deck immensely. It's less characterful than most and has superb timing, imaging and tonal resolution. More importantly it does serious bass, something that you'd think would be a given at this price, but tastes clearly differ as many alternatives sound lightweight by comparison. Obviously the Inertia platter helps here and it will increase the price from August 2010 onward, but even then the value will be strong. These impressive sonic qualities combine with very high build and finish to make a highly desirable turntable that's ready for most tonearms you'd care to throw at it.